It’s 10:30 pm when we arrive at Seven Springs Mountain Resort’s mountain operations headquarters. I’m one of a half-dozen group of visiting writers and bloggers, here to get a behind the scenes glimpse at what it takes to make snow. Together, we waddle into the shop like penguins, bracing against the violent wind. Kirk Russell, the Seven Springs Mountain Manager, is there to greet us. His broad build fills the doorframe. Dressed head to toe in Carhartt brown, his cheeks flushed from the constant freeze-thaw cycle of working outdoors, he gives our puffy-clad group a bemused smile. “What, is it cold outside?” he says in that endearing Pittsburghian way, where ‘out’ sounds more like ‘aht’ and the intonation suggests he already knows the answer. He laughs and ushers us inside. The shop floor is open and sparse in a utilitarian kind of way with large garage doors and ceilings tall enough to accommodate a couple of snowcats. There’s one parked there now, its engine purring, and we shuffle into the office as it backs out into the darkness of night. 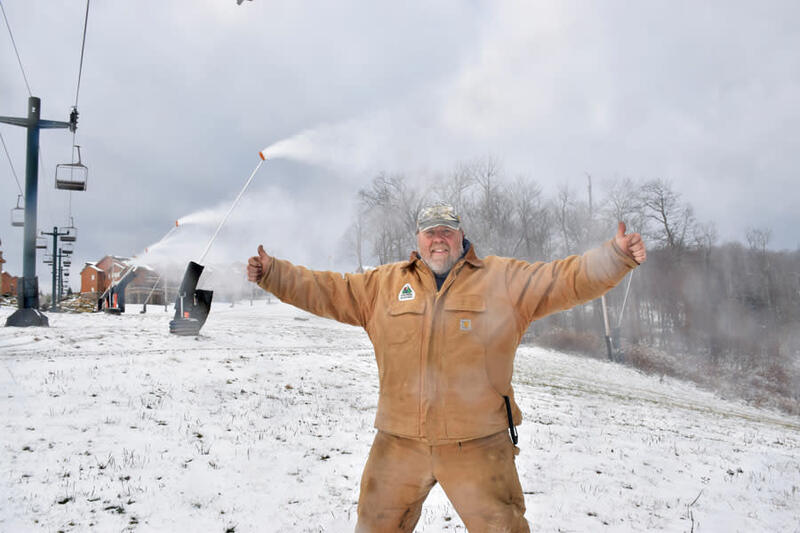 After 37 years of making snow at Seven Springs, Russell is full of other such anecdotal wisdom, which he dispenses to his crew like a grandfather would his grandchildren. In snowmaking expertise, Russell comes second only to the industry’s godfather, and his own mentor, Herman Dupré. The son of Adolph Dupré, a German immigrant who settled on Seven Springs Farm and opened his property to skiers in the late 1930s, Herman was a master tinkerer. In 1960, Seven Springs installed their own double chairlift and snowmaking system, both of which were Herman Dupré’s designs. Dupré later held 34 patents for his snowmaking systems, and that, in turn, evolved into HKD (for Herman Kress Dupré) Snowmakers, North America’s leading manufacturer of snowmaking technology. The company’s first product, the HKD Standard, was the first snowgun to be used ubiquitously in ski resorts. Now, the HKD SV10 is making its mark as one of the most energy-efficient guns available. Russell knows this because he’s built many of HKD’s guns from the ground up. Our group trails behind Russell as he heads back outside. The thermometer reads a balmy 20 degrees, but with the wind, it feels well below that. He leads us to a snow gun and, with a few switch flips, brings it roaring to life. A wide jet of snow comes blasting out from the gun. He looks up at it, beaming. Hesitantly, I step into the line of fire, er, snow. The force of the gun nearly knocks me down. Russell comes up and tugs at the hood of my jacket. It’s light and fluffy and beautiful and I tell him as much, but my cheeks are starting to lose feeling. I step back out of the blast, but Russell stays put. Over the snow gun’s grumble, unfazed by its arctic squall, he launches into an impressively thorough summary of Seven Springs’ snowmaking operations: how the resort stores water in 40 collection ponds on the property including the main “stomach” Lake Tahoe; how the water is pumped from Lake Tahoe to the snow guns at a rate of almost 20,000 gallons of water per minute; that the resort’s 1,200 snow guns use less than 20 cubic feet of air per minute (cfm); that it takes 200,000 gallons of water to cover an acre of ground in one foot of snow; how over the course of the winter, the resort will use 350 million gallons of water and drain Lake Tahoe at least three times. Shivering, trying desperately to absorb the facts, I can’t help but fixate on Russell’s total nonchalance of the elements. Small mounds of snow have accumulated on his shoulders, his beard a literal ice cube. I’m cold just looking at him. “Aren’t you freezing?” I finally ask.